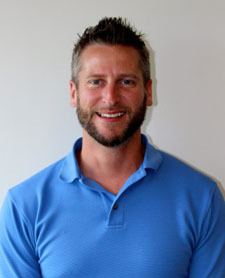 Dave is a graduate from the Canadian College of Massage & Hydrotherapy, class of 1999. He has been practicing in Peterborough for over 15 years and with Trent Health in Motion for just over 10 years. Dave was a former instructor in the Massage Therapy program at Sir Sanford Fleming College before joining Trent Health in Motion. He has completed his Active Release Techniques training for the lower extremity and is currently a certification candidate with the Canadian Sport Massage Therapist Association. Dave has experience ranging from work at the Canada Winter Games, to working with the COC (Canadian Olympic Committee) at the Toronto 2015 Pan Am Games. He has also worked with CSIO (Canadian Sport Institute of Ontario) in Florida with the National Swim Program, along with Olympic medalists, Professional Athletes and Amateur Athletes from across the country. Outside of work with Trent Health in Motion, Dave coaches with the Varsity Cross Country running team at Trent U and with the Peterborough Legion Track and Field Club. He also competes in Masters Athletics and competes in road cycling throughout the province.